Here we are standing under the sign that Troy engraved and painted when he proposed to me four years ago. On the other side, the sign reads: “Will you marry me?” We’re celebrating our third wedding anniversary next week and are excited about our next steps as a family of three. Troy and I have some exciting news: we’re moving to Austin, Texas! 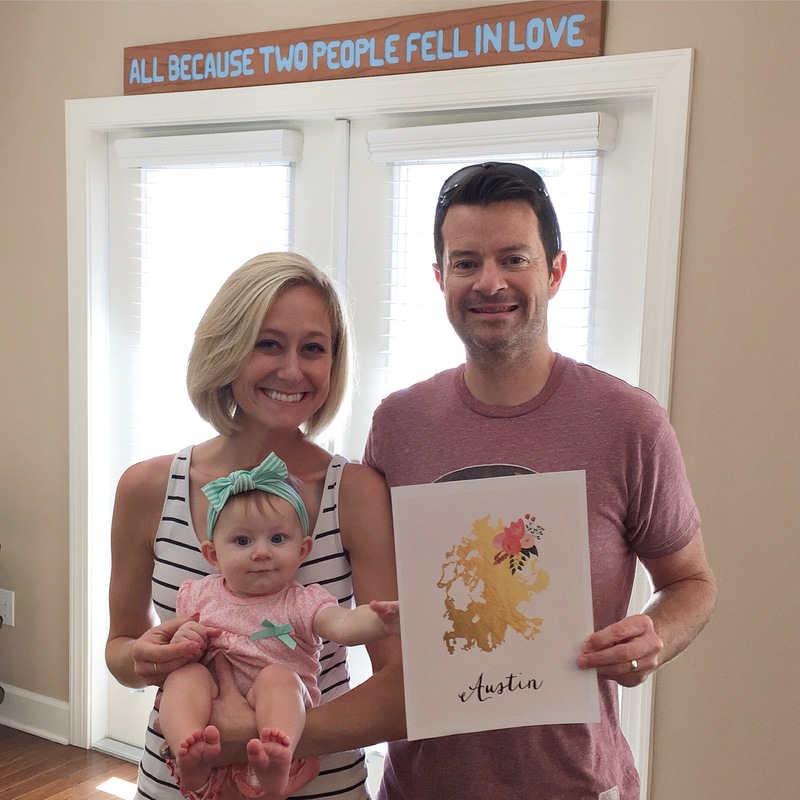 Ever since Madelyn was born, we’ve wanted to live closer to family. This move makes that possible. Troy, who’s from Texas, has accepted a great new job at a hospital north of Austin. He’ll be starting in early January. I’ll continue working for Images & Voices of Hope — a job that affords me the flexibility of working from anywhere. We have a lot to figure out between now and mid-December when we move. We’re in the thick of a time-consuming transition, and the weight of it all has admittedly left us feeling overwhelmed. But we’re making progress. In the past week, we’ve found a daycare for Madelyn and a home that we want to buy. Next up is trying to sell our townhouse and figuring out how we’re going to pack and move our stuff and ourselves cross-country. I love St. Petersburg and will miss it dearly. It’s the city where I launched my career, got married, and started a family. It’s my home. Lately, though, I’ve gotten the same feeling I had my senior year of college — the feeling that it’s time to step outside my comfort zone and establish new roots in a different place. Time to embrace all the beautiful uncertainties that inevitably come with big life changes. It helps knowing that Troy and I are making this decision together — with and for our baby. We want to raise Madelyn in the company of family members instead of having to travel 1,000+ miles to see them. We want Madelyn to grow up playing with all the other kiddos on Troy’s side of the family. We want more built-in babysitters so that we can go on date nights and occasional weekend getaways. It goes without saying that we love being with Madelyn, but we need “us time,” too. The move to Austin doesn’t bring us any closer to my family (I miss you, dad!) but we’re going to make it a point to visit Massachusetts a couple of times a year. Madelyn may be a southerner, but we can’t let her forget her New England roots. We don’t want her to forget her friends in Florida either, so we’re expecting y’all (did I just say that?) to visit once we’re settled in Austin. The next few months are going to be crazy and fun. Kind of like parenting. We’re hoping for a smooth-ish transition, and we’re excited about writing this next chapter in our family story. It’s my favorite story — one that’s marked by auspicious beginnings and audacious love. I have a feeling I’ll be writing lots of letters to Madelyn, and journal entries about her. 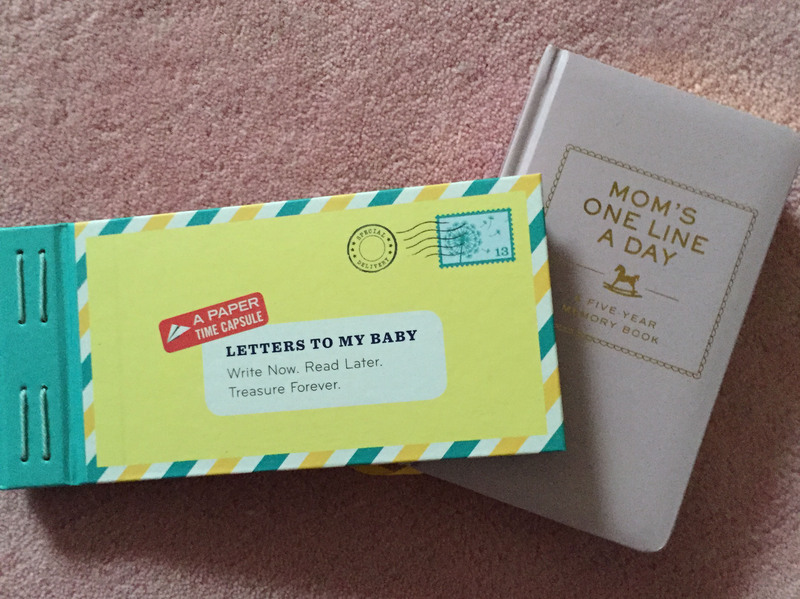 I always wish I had more letters from my mom, who passed away when I was 11. My hope is that Madelyn will find comfort in them when she’s older. 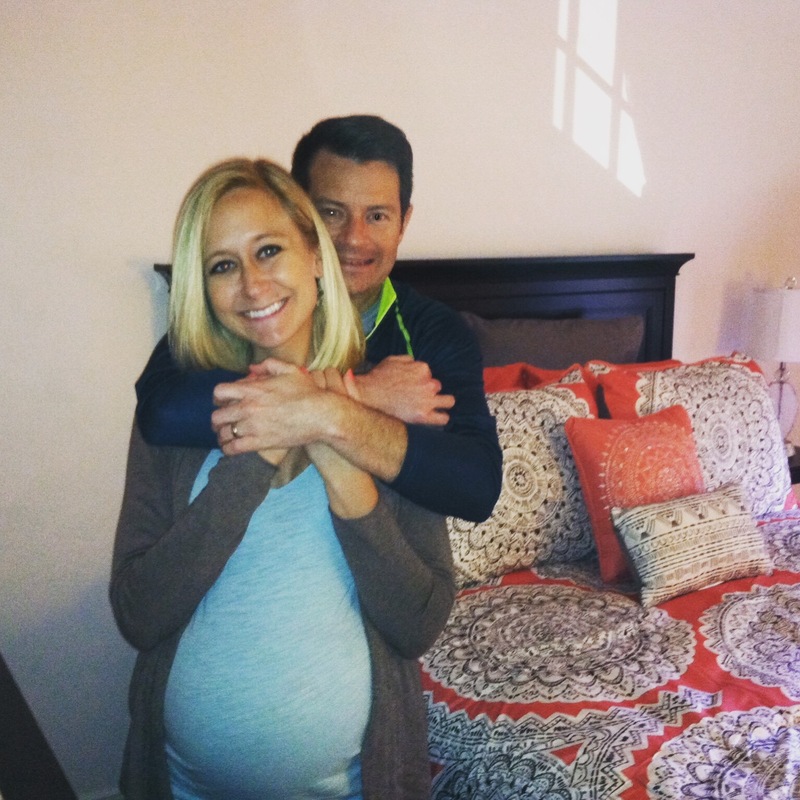 Your due date is quickly approaching, and Mom and Dad can’t wait to meet you. For nine months, you’ve rested under and in my heart. You’ve been my source of inner strength, my motivator for eating healthy and treating my body with respect. I find myself rubbing my belly all the time; it makes me feel closer to you and reminds me that the mother/daughter bond is already very much formed. Lately, when I’m sitting on the couch at night, I’ve been able to feel your little hands (or are they feet?) pressed against my skin. I grab dad’s hand and hold it against my belly so he can bond with you too. Every morning before he goes to work, he talks to you. You wriggle at the sound of his voice. As the days pass, it’s getting harder to sleep and stay active. 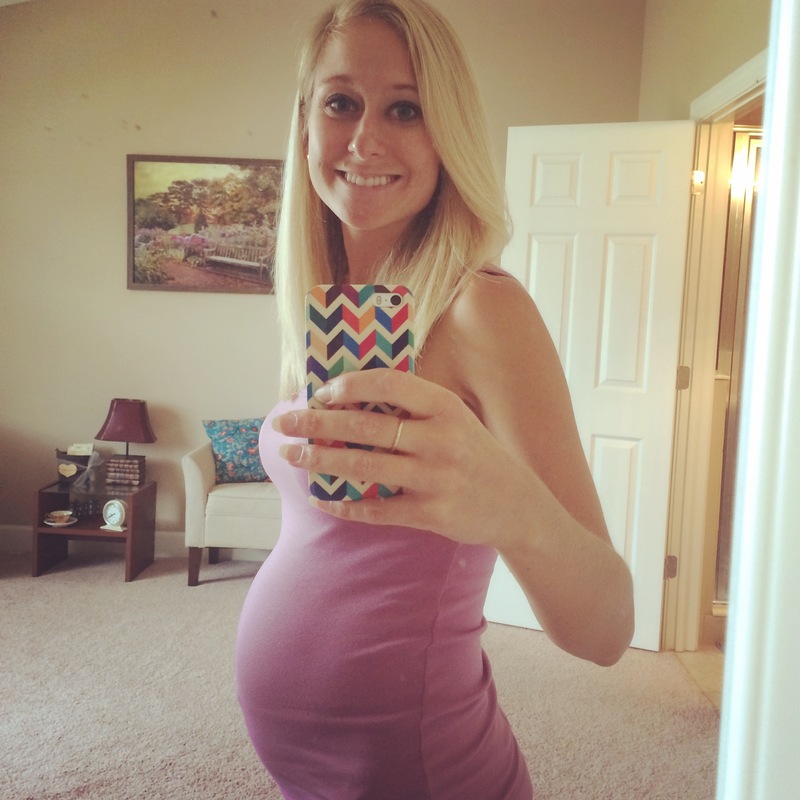 I finally stopped going to prenatal yoga this week at the 36-week mark. But I still go for walks along the water every day. I’m preparing for when we’ll get to go for walks together — you in your stroller, me pushing you and introducing you to dolphins, ducks, and flying fish in Tampa Bay. For now, I’m focused on pushing through all the stretching, pulling, and squeezing taking place inside my belly. I like to think that the aches and pains are the result of you tugging at my heartstrings, making me fall more in love with you each day. I feel like I know you so well already, and yet I still have so many questions. What will you look like? Will you have hair? Blue eyes? A button nose? What will your cry sound like? Will you recognize my voice and your dad’s? What will it feel like to finally hold you in my arms? You’ve already given me so much — most importantly the gift of motherhood and a greater sense of gratitude. As much as I’ve struggled with the expectations that come with being a woman — especially when it comes to body image — you’ve given me a newfound sense of confidence and a renewed appreciation for womanhood. It’s remarkable that my body has enabled me to carry you, nourish you, and get you to the point where you’re healthy enough to enter this world. Your dad and I are ready for this new beginning. You may be here in one week, or two, or three, or four, depending on when you decide to make your debut appearance. As the nurse in one of my childbirth classes said, “Only your baby knows her birthday.” I’ve taken birthing classes and have read lots of books about pregnancy and baby care over the past several months. I’ve learned plenty from the experts, but I know you will be my best teacher — showering me with new lessons that I can’t find in books. You, me, and dad will learn together, as a family. We will give you all the love we have in hopes that you will grow up to be a strong, confident woman with a generous spirit and a desire to always keep growing and stretching in new ways. I hope you’ll sing in the sun and run in the rain. I hope you’ll appreciate the satisfaction of solitude and the comforts of company. I hope you’ll inherit your dad’s affinity for taking risks, and that you’ll embrace failure as an important ingredient for success. My dear Madelyn, may you stray from the original recipe when creativity calls for it, and may you grow to love life as much as mom and dad love you. See you soon, sweet pea. Earlier this year I ran my first marathon. Now I probably couldn’t even run a mile. It’s been seven months since I last ran – the longest stretch I’ve gone without running in 15 years. Running has always been an integral part of my adult life. It’s been my outlet for stress, my connection to the outdoors, my time to reflect. 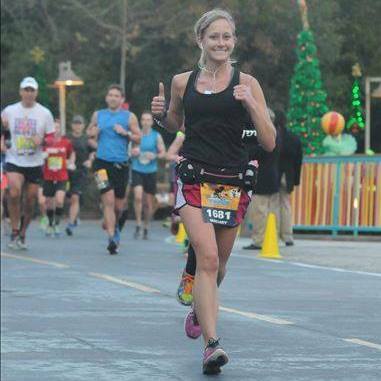 Feeling strong during my marathon at Walt Disney World earlier this year. Soon after I found out I was pregnant, I tried to go running. Something about it didn’t feel right, though. Maybe it was my first trimester nausea or my motherly instinct already kicking in and telling me to slow down, to stop sprinting through life. Early on, I realized I was embarking on a new marathon of sorts, a nine-month one that would push my body and mind in ways they had never been pushed before. 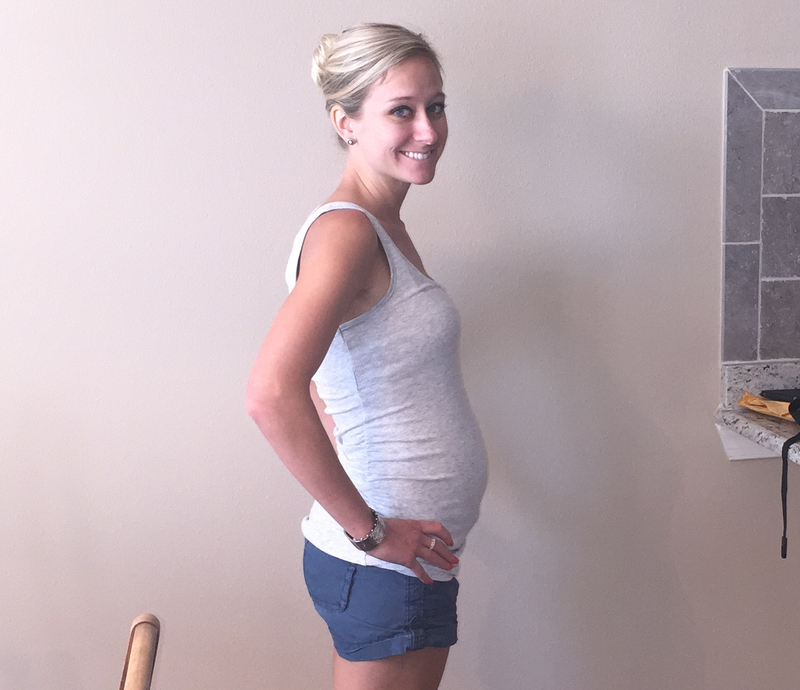 I’m seven months pregnant and people still ask me, “Are you continuing to run?” I’m often surprised by the question, especially when I look down and see my growing belly — a protrusion that sometimes makes it difficult to walk, let alone run. “No,” I tell them matter-of-factly. 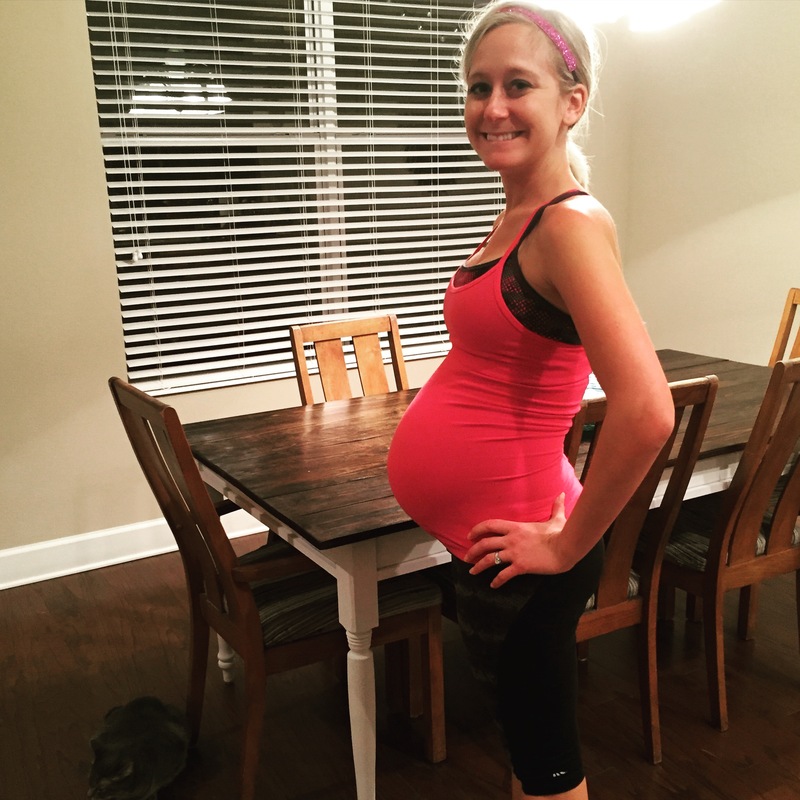 “I haven’t really run at all during my pregnancy. It just never felt right.” Surprisingly, I haven’t felt any shame or guilt when admitting this. I thought I would, given my tendency to cling to my identify as a runner, a marathoner. I think I’ll be eager to return to running after Madelyn is born. 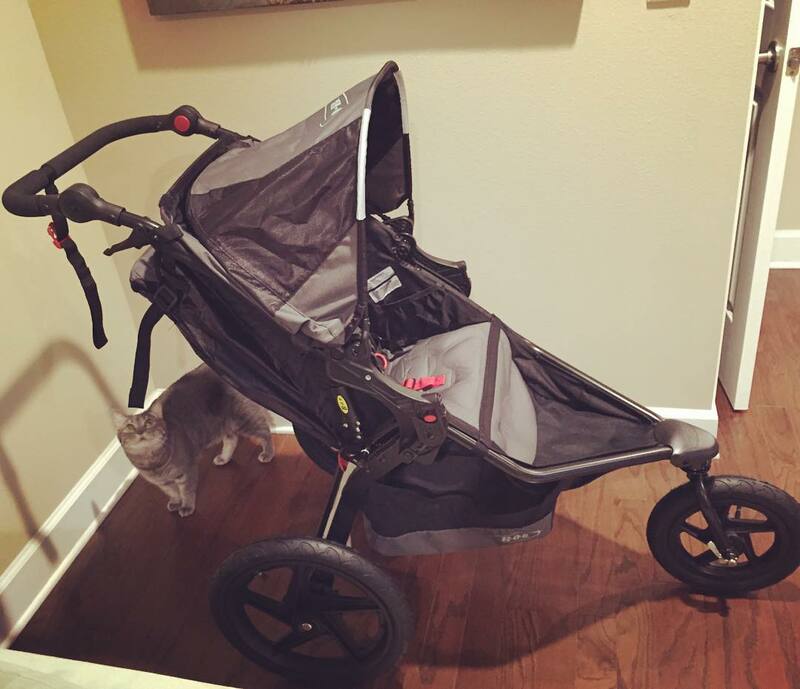 My aunt and uncle bought me a BOB jogging stroller, which I can’t wait to use around St. Pete. 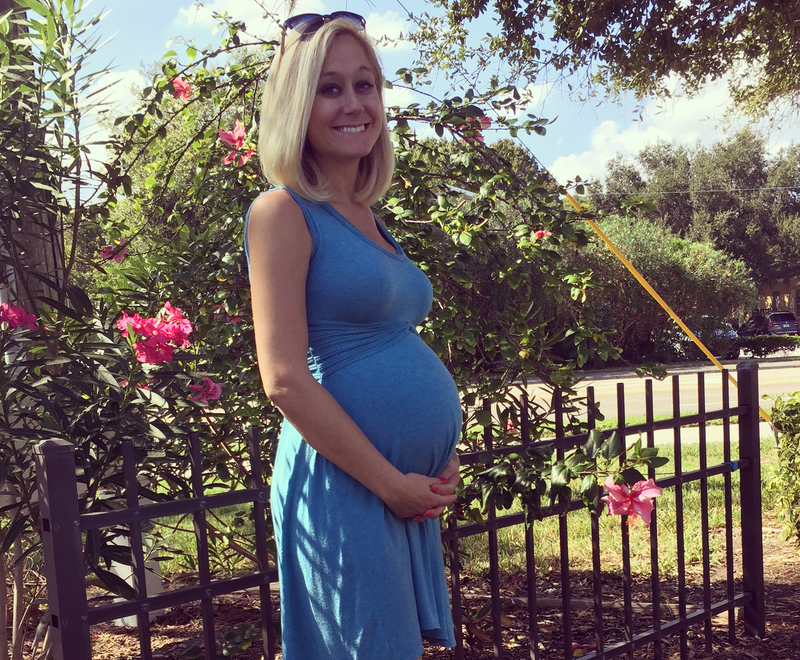 Pregnancy has been an ongoing lesson in learning how to be more gentle and patient with myself. Instead of running, I’ve been walking, swimming, and taking prenatal yoga classes. Exercising every day helps me maintain part of my routine in the midst of so many physical and emotional changes. Sometimes, I get frustrated during prenatal yoga. It’s a flow class, so the instructor keeps us moving throughout the entire 75 minutes, with the exception of a few minutes at the beginning and the end. Some nights, my belly feels huge, my body heavy. Another downward dog??? I’ll think to myself after the 10th one in class. I don’t want to bend down and touch my toes again; my belly won’t let me. Is it shavasana time yet? Despite my frustrations, I’ve been thinking a lot about how yoga and pregnancy have helped me to become more accepting of my body’s limitations. I’ve learned to embrace modified poses, realizing I don’t have to fuel my ego and my competitive side by always doing the fullest expression of every pose. Madelyn seems to like yoga; she kicks a lot after each class. So what if my dancer pose isn’t quite as graceful as it used to be? Or if my tree pose is a bit lopsided? Instead of lamenting my imperfect, sometimes wobbly poses, I’ve embraced other ones. During every class, I channel my inner goddess, warrior, and happy baby. “Breathe into the discomfort,” my yoga teacher says, reminding me that discomfort is not the same as pain. 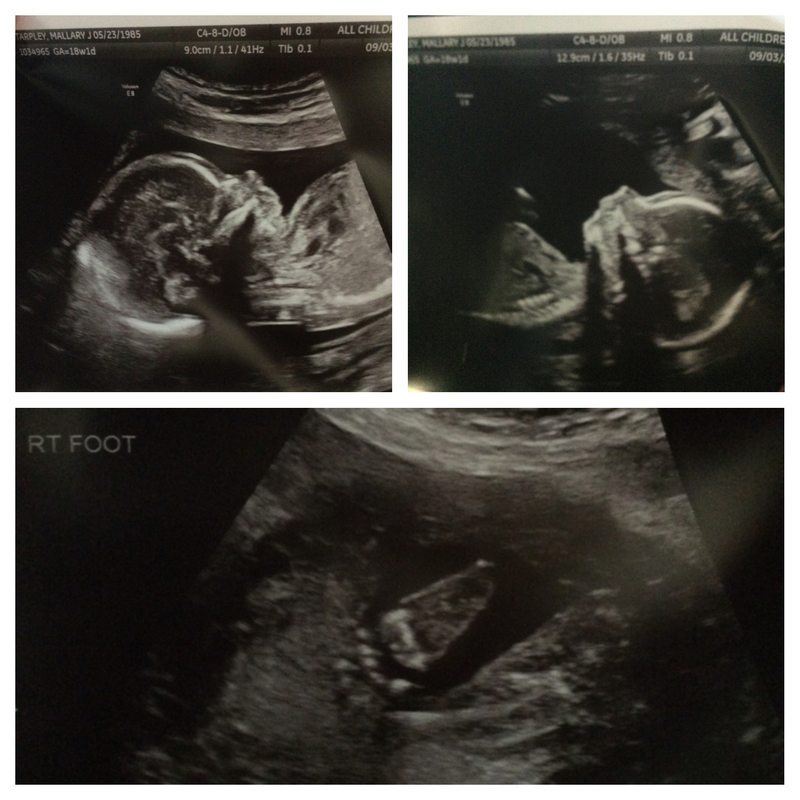 I know that in two short months, I’ll have to breathe into a lot of discomfort during labor and push through pain. I’m almost 30 weeks into my pregnancy and I wonder how much longer I’ll be able to go to yoga. I plan to go for as long as I can, so long as I feel safe and (mostly) comfortable. Everything I’m doing now is preparation for the big day. This nine-month marathon is challenging, but it’s the most rewarding physical endeavor I’ve ever endured. The finish line is getting closer, and I’m walking toward it with more excitement each day. Troy has always been my cheerleader during my races. That’s now the case more than ever during this nine-month marathon. This isn’t the best quality photo, but I love how happy we look in it. With each passing week, I feel more confident about Baby Madelyn’s health. She is at the age of viability, meaning survival outside the womb would be possible. At 27 weeks, she’s the size of a rutabaga, or a bunch of bananas. She’s about 14 inches long and a little over 2 pounds. I recently finished the book “Brain Rules for Baby” by molecular biologist John Medina. It’s a fascinating read that’s filled with scientific research and practical advice about how to provide the best environment for your baby’s brain development, inside the womb and after birth. (Here is a roundup of related tips.) It’s a pretty easy read, so I’d recommend the full book. It’s the one baby book I’m encouraging my husband Troy to read. My desire to have a healthy baby motivates me to make better choices — about how much rest I get, what I put into my body, and how much I work. I still have to watch my stress levels, and I need to make a conscious effort every day to not let weight gain distort my body image or my relationship with food. But overall, I’m amazed by how my pregnancy has helped me to be healthier and happier. It has also helped bring me and Troy even closer together. 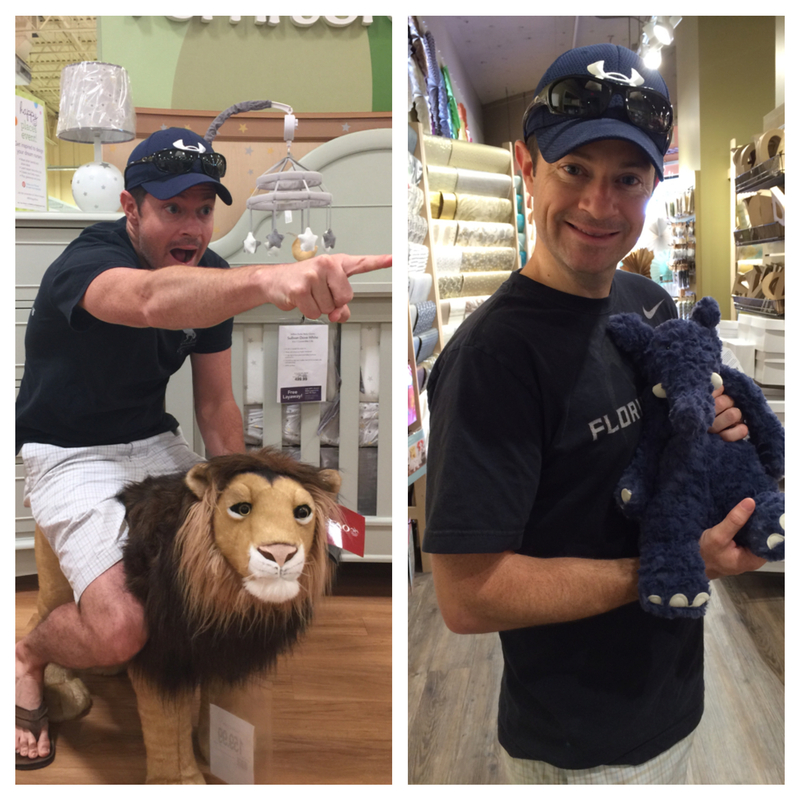 “We’re going to be parents … eeeeek!” is a common refrain in the Tarpley household these days. I’ve always wanted to be a mom, now more so than ever. I recently learned that I’ll be able to take 11 weeks of maternity leave once Madelyn arrives. I love knowing that I’ll have so much time to focus on my daughter — to care for her, to get to know her. Until then, I’ll keep playing her music, reading to her, and patting my belly when she turns it into a punching bag.